The abdominal consist of four basic groups arranged to produce strategic lines of pull to accomplish their purpose. They typically command a significant amount of attention during rehabilitation and training programs to improve performance. Why is that? 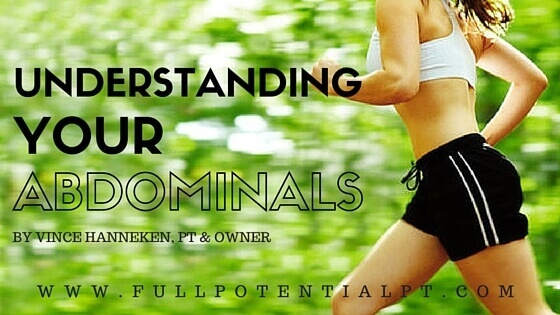 Part of the reason the abdominal get so much attention is because they appear to have a relationship with numerous areas in your body. In a general sense when the abdominal’s are strong and trained, they make the other muscles in your body more efficient. These other muscles work less as a result. This helps them not fatigue as quickly and not over tighten as much. You would experience this effect as better performance whether you are doing physical work or athletics. Suffice it to say, the abs help our body to work more as an integrated system or a system that is tied together better. Strong abdominals allow stress to be shared throughout the body as opposed to being concentrated into a specific hard working zone. For example, walking with well-trained abdominals contributes to better pelvic control. This makes your quadriceps (front thigh muscle) more efficient and can unload your knee and related areas from excessive stress. This is even more important with running where the body is landing with up to five times body weight on one leg. As we look down the leg to the foot, a strong set of abdominals improves control of the pelvis and hip which reduces excessive rotation in the leg. This benefits not only knee mechanics but the foot as well. When rotation is controlled to within the limits designed for that joint, stress is reduced. Premature osteoarthritis in a joint can be the result of excessive stress over time. Rotation is a part of this stress. Probably one of the most crucial abdominal relationships is how they protect the lower back from excessive strain. Inadequate abdominal strength contributes to over shortening of the back muscles and/or compression in the spinal joints. Short back muscles become less adaptable to stress. For example, if you slip and your back suddenly gets pulled – will the muscles adapt or lengthen in response to this stress? A group of muscles that gets too short is typically a strain waiting to happen under the wrong conditions. So the abdominals not only protect your back at the time of lifting but also prevent the back muscles from becoming too short over time which makes them less susceptible to injury. Even with the highly repetitive activity of breathing we find a very close relationship with the abdominals. Your diaphragm (main breathing muscle for inhalation) depends on a strong set of abdominals (especially your obliques) to work effectively with pulling in your next breath. If your abdominals are getting too long or weak, the diaphragm will begin to over shorten and become less effective at it main job – inhalation. The result can set up a cascade of reactions in your muscle system to compensate for something that happens over 20,000 times a day. This can be a significant factor in chronic neck, shoulder, and upper/lower back pain syndromes. The abdominals play a pivotal role in many basic body processes related to posture, breathing, and core control for efficient activity in life and sports. There is not a better muscle to invest time and effort to keep strong. When the abdominals are strong and trained for control, your body handles these stresses more effectively which leads to more efficient action whether it is walking, running, golf, or even yard work. If you would like to learn a comprehensive method for upgrading your abdominals to decrease chronic muscle tightness talk to your doctor about a referral to Full Potential Physical Therapy.